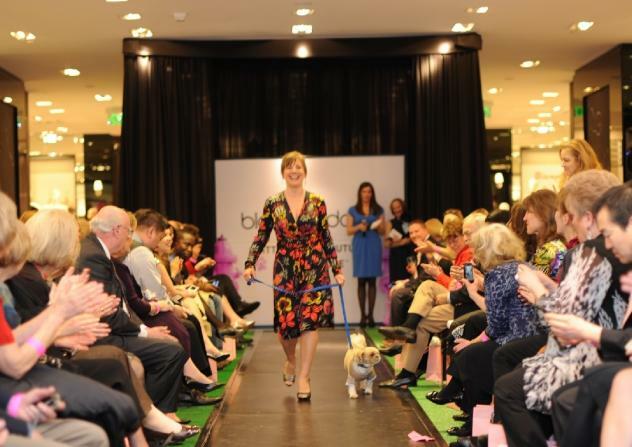 Both two-legged and four-legged models walked the runway at the second annual Critters for the Cure fashion show gala. Be sure to check out all 104 of our photographs from this event HERE! CHEVY CHASE, Md. -- Both tongues and tails were wagging yesterday evening as Critters for the Cure held its second annual Fashion Show Gala at Bloomingdale�s of Chevy Chase. The celebration began with an exclusive VIP reception at 6:00 p.m. featuring tons of savory gourmet fare from the likes of Clyde�s and The Capital Grille, among others. Barefoot Wine & Bubbly provided guests with bottomless glasses of various vintages of both white wine and champagne and attendees liberally doled-out toasts, throughout the night, in return. At approximately 7:15 p.m., the gala�s signature event commenced in the form of a special fashion show highlighting the latest in spring fashions by Bloomingdale�s. The participating models who walked the runway at last night�s event were all women cancer survivors and each was accompanied by her favorite four-legged companion (also stylishly attired courtesy of Doggie Couture of New York). ABC7 reporter and host of the daily TBD talk show �Let�s Talk Live� Natasha Barrett served as the evening�s mistress of ceremonies, graciously introducing the models and event organizers, who also took to the runway at the end to honor a team of outstanding local doctors with a �It Takes A Village� service award, as well as conduct a live auction for various prizes. Natasha Barrett (in blue) served as the night�s mistress of ceremonies. While unable to attend the event in person, Senator Barbara Mikulski (D-MD) was also presented with an award recognizing her decades-long support of women�s health issues in government. A D.C.-centric charity (90% of every dollar donated goes directly to providing local patient assistance) that assists women in bridging the gap between life before cancer to life beyond cancer, Critters for the Cure also strives to promote the healing relationship between patients and their pets. Many of the runway models also modeled in the annual Critters for the Cure calendar. A stylish and cute approach to licking cancer!